This was the first thought that came to my mind when I read a common email from one of my good friend. He was thanking all the people for the help that was extended to him. It was not a great help at all, just a basic human response to someone in trouble. Part of the email was as below and upon reading it, I almost had tears in my eyes." Many time I am reluctant to take service and unsure of how to repay for all the services that are been rendered to us I am prepared to remain to pay back by serving in some life time instead of going back to God Head." What great thing have we done to receive such words of thankfulness, appreciation, recognition of ones effort, indebtedness. What makes someone so different to others, who simply take others help in the hour of need and simply walk away when their job is done- called as using someone like a doormat. Well, this is something that each one of us needs to develop and practice and needless to say, Gratitude makes wonders in ones life. · Being thankful : Thankful to everything in life, the very fact that you are living, to the Supreme God who gave us this unique thing called Human birth and the life, being thankful for all the things that you have in life - friends, possessions, family, Sun, Moon, Fresh air, Nature so on..
· Show appreciation and return kindness: Gratitude is not a mere sentiment and a lip service. It is actually, appreciating the work other person did for you, how much small or big and to return the kindness by means of words, actions and feeling to other, to God, to the world. · Being Grateful and thankful: which means, I don't deserve this but, because of so and so's kindness, I received this or I have this. Beauty, name, fame, recognition etc. · Sense of obligation and indebtedness: A person with gratitude has a sense of obligation. He thinks that because this person had done so much for me, I will do much more. I had to do it because; I am indebted to do so. 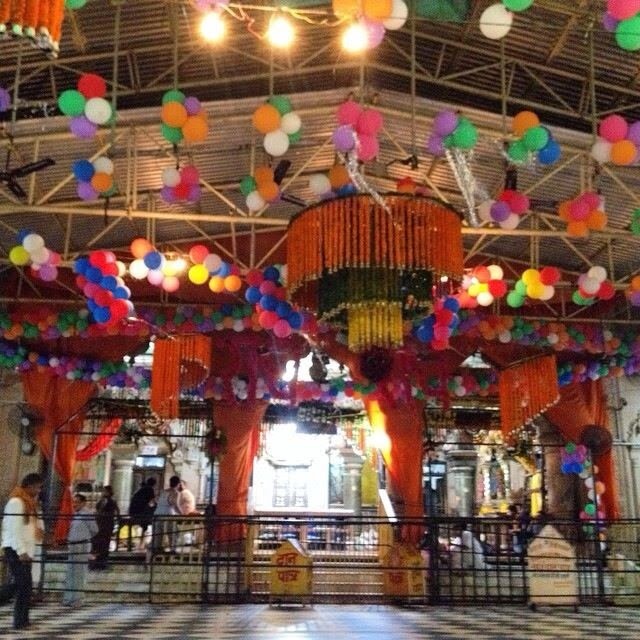 In the Vedas, we see prayers of gratitude at numerous places. As soon as one gets up from his bed and before he puts his feet on the Earth - one remembers how wonderful mother earth had been to him, and there is a wonderful prayer glorifying mother earth. Similarly, for Sun, Moon, water, air, sky, Cow, parents there are prayers of Gratitude. Please, share your thoughts about Gratitude. Bhagavad Gita Chapter 6.Verse 30. This is one of my favorite verses from Bhagavad Gita and the story below is one that I received from my well wisher. The story is so nice that, I immediately wanted to share it but, some how did not materialise till now. So, in short the moral of the story is that, God has plans and justice for everyone. We just have to have patience. Once there was a sweeper in a well known temple and he was very sincere and devoted. Every time he saw thousands of devotees coming to see the Lord, he thought that the Lord is standing all the time and giving auspicious sight and He must be feeling very tired. So one day very innocently he asked the Lord whether he can take the place of the Lord for a day so that the Lord can have some relief and rest. The Deity of Temple replied, "I do not mind taking a break. I will transform you like myself, but you must do one thing. You must just stand here like me, smile at everyone and just give benedictions. Do not interfere with anything and do not say anything. Remember you are the deity and you just have faith that I have a master plan for everything. The sweeper agreed to this. The next day the sweeper took the position of the deity and a rich man came and prayed to the Lord. He offered a nice donation and prayed that his business should be prosperous. While going, the rich man inadvertently left his wallet full of money right there. Now the sweeper in the form of deity could not call him and so he decided to control himself and keep quiet. Just then a poor man came and he put one coin in the donations box and said that it was all he could afford and he prayed to the Lord that he should continue to be engaged in the Lord's service. He also said that his family was in dire need of some basic needs but he left it to the good hands of the Lord to give some solution. When he opened his eyes, he saw the wallet left by the rich man. The poor man thanked the Lord for His kindness and took the wallet very innocently. The sweeper in the form of the Deity could not say anything and he had to just keep smiling. Now the sweeper in the form of Deity wanted to say that the sailor is not the thief but he could not say so and he became greatly frustrated. The sailor looked at the Lord and asked why he, an innocent person, is being punished. The rich man looked at the Lord and thanked Him for finding the thief. The sweeper in the deity form could no more tolerate and he thought that even if the real Lord had been here, he would have definitely interfered and hence he started speaking and said that the sailor is not the thief but it was the poor man who took away the wallet. The rich man was very thankful as also the sailor. In the night, the real Lord came and He asked the sweeper how the day was. The sweeper said, "I thought it would be easy, but now I know that your days are not easy, but I did one good thing." Then he explained the whole episode to the Lord. The Lord became very upset on hearing this whereas the sweeper thought the Lord would appreciate him for the good deed done. The Lord asked, "Why did you not just stick to the plan? You had no faith in me. Do you think that I do not understand the hearts of all those who come here? The entire donation which the rich man gave was all stolen money and it is only a fraction of what he really has and he wants me to reciprocate unlimitedly. The single coin offered by the poor man was the last coin he was having and he gave it to me out of faith. The sailor might not have done anything wrong, but if the sailor were to go in the ship that night he was about to die because of bad weather and instead if he is arrested he would be in the jail and he would have been saved form a greater calamity. The wallet should go to the poor man because he will use it in my service. I was going to reduce the rich man's karma also by doing this and save the sailor also. But you cancelled everything because you thought you know my plan and you made your own plans." 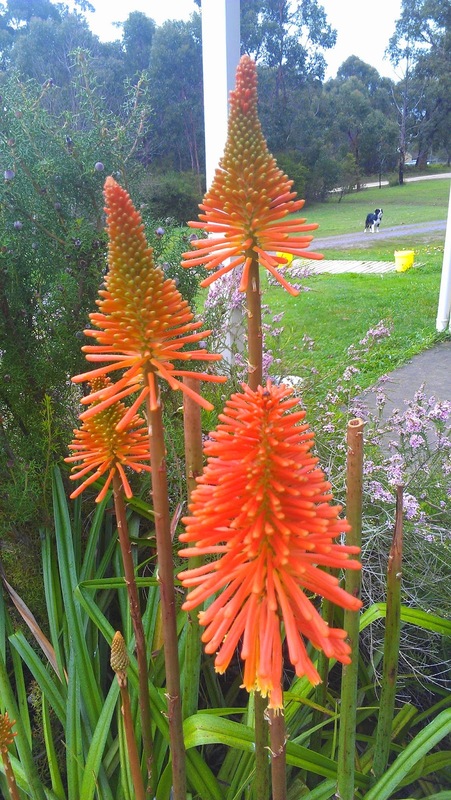 Spring in Melbourne started few days ago and that's why, we can see all the trees blooming with flowers. 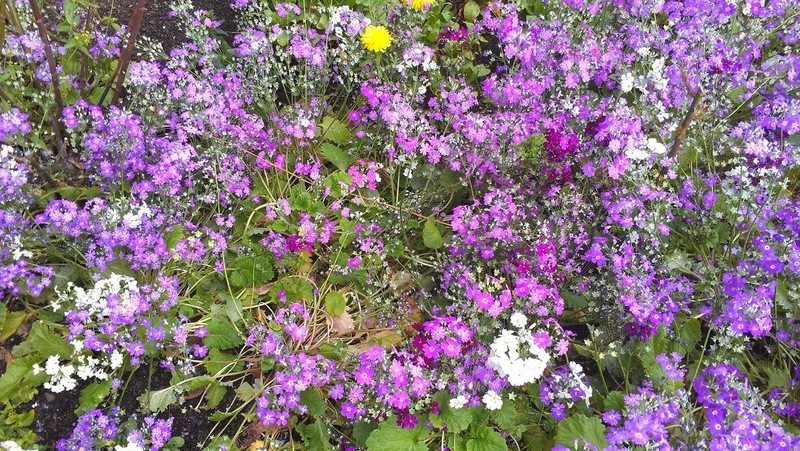 The spring in Melbourne is the most changeable season of the year. A full range of weather may be experienced within a few days, from warm, calm and sunny to cold, windy and showery. There are several cloudy to overcast days. September is another windy month. Most strong winds are from the north, these often occur on the warmer days. There also are occasionally strong cold southwest winds with showery weather. The temperature usually reaches the mid-20s for the first time since April. Nights are cool, frost is fairly rare, and the lowest temperature for the month in the city being about 4ºC. Fog though uncommon, sometimes does come. Rainfall is higher in spring than in winter, falling on one day in two. There are days with only a little drizzle or a light shower but heavy rain falls occasionally. 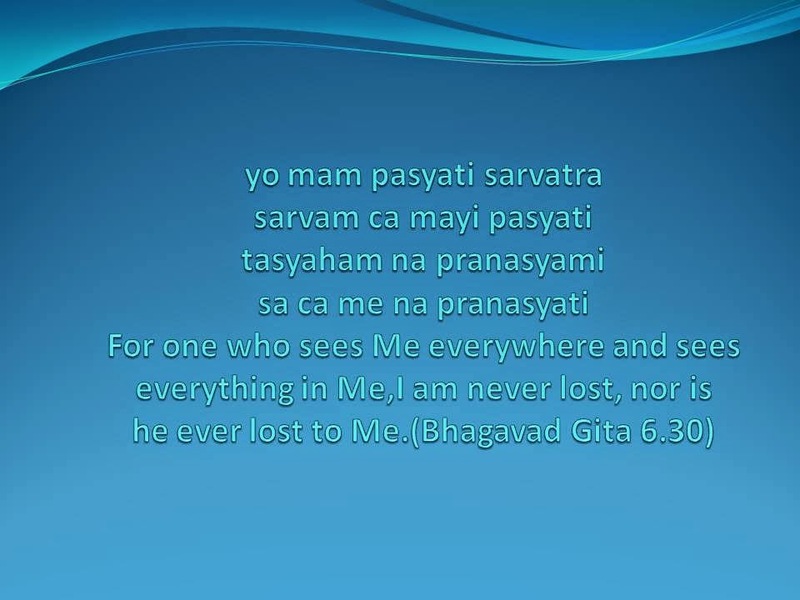 Please enjoy this interesting verse from Srimad Bhagavad Gita - Chapter 10: Verse 35. Translation and purport by Srila Prabhupad. PURPORT: It has already been explained by the Lord that amongst all the Vedas, the Sama Veda is rich with beautiful songs played by the various demigods. One of these songs is the Brhat-sama, which has an exquisite melody and is sung at midnight. In Sanskrit, there are definite rules that regulate poetry; rhyme and meter are not written whimsically, as in much modern poetry. Amongst the regulated poetry, the Gayatri mantra, which is chanted by the duly qualified brahmanas, is the most prominent. The Gayatri mantra is mentioned in the Srimad-Bhagavatam. Because the Gayatri mantra is especially meant for God realization, it represents the Supreme Lord. This mantra is meant for spiritually advanced people, and when one attains success in chanting it, he can enter into the transcendental position of the Lord. One must first acquire the qualities of the perfectly situated person, the qualities of goodness according to the laws of material nature, in order to chant the Gayatri mantra. The Gayatri mantra is very important in Vedic civilization and is considered to be the sound incarnation of Brahman. Brahma is its initiator, and it is passed down from him in disciplic succession. It’s interesting to see so many misconceptions about Spiritual Life. So to sum up, one practicing a spiritual life is never lazy, never take things for granted, never gives up his duties and responsibilities in an untimely manner, never looses his drive or passion for doing things in a better way or at work because, he believes in doing his best, truthful, tolerant and so on.. Welcome to the world of spirituality. Long time ago, I saw a movie where the hero is a lazy fellow and basically wants to escape working hard and getting up early to go to work, be accountable at job etc. He somehow marries a daughter of a wealthy man, hoping to become a successor to the riches the man had. But, to his utter dismay, the girl wants to lead a simple life and does not want to take any help or money from her rich parents. One day the Hero happens to see group of Sanyasis / renunciants in orange dress being invited by a rich man. He notices that they are all being fed sumptuously with all different items and sweets etc.He immediately makes up his mind and decides give up his family life, wife and become a Monk. He goes to that ashram and requests the head Monk for permission to become a Sanyasi / renunciant and takes up orange dress. Just when he was daydreaming about all the sweets and food that he is going to get, he was harshly woken up from his sleep and was asked to work in the vegetable farm of the ashram. After a tiring morning of work, he was served a simple meal of dhal and chapati and was asked to get back to work. And, the life goes on...Slowly, the Hero realises that life in the ashram is after all not so easy. Finally, realises his mistake and gives up the orange dress and goes back to his wife and family life. Thankfully, his wife allows him to comeback and after that he lives happily, content with what ever he has. “Sri Caitanya Mahāprabhu also. He never asked anybody to change his position. He simply recommended that you associate with pure devotees and hear from him. That's all. Śrī Caitanya Mahāprabhu never asked anybody that Sometimes this Krishna consciousness is misunderstood to be inertia, and one with such a misunderstanding often withdraws to a secluded place to become fully Krishna conscious by chanting the holy name of Lord Krishna Sometimes the so-called devotees of Krishna... In Vṛndāvana you'll find that they are keeping themself in a secluded place and supposed to be chanting Hare Krishna. 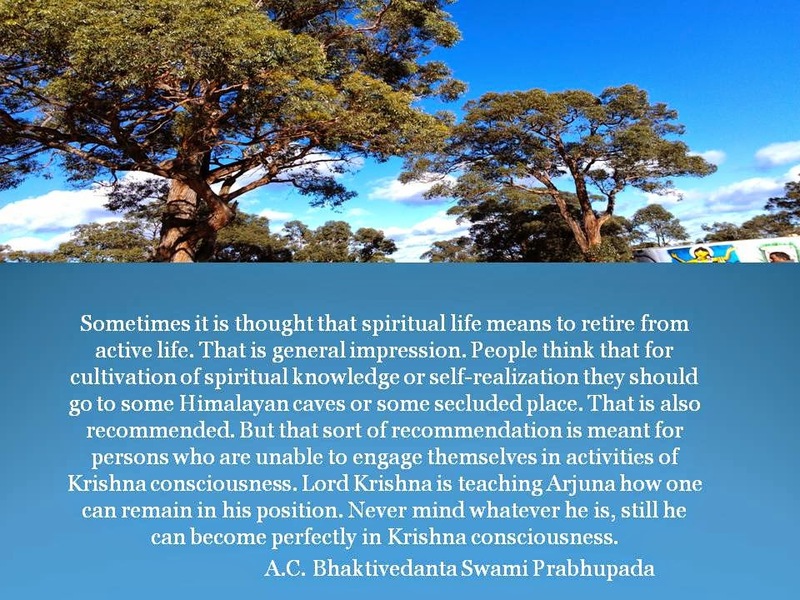 But practically it has been seen that by such artificial way of becoming Krishna consciousness, it does not make anyone advanced. I have seen practically. They are living in a secluded place,chanting Hare Krishna, but practically, when he comes out, he's smoking. You see. He cannot give up even smoking, and what to speak of this material world? You see? That is artificial. This is not recommended. First of all you become mature, then secluded place. Otherwise there is no secluded place. Maya is everywhere. Maya will dictate, "Oh, you are so tired. Why don't you come out and smoke a cigarette?" Yes. And he thinks he's advancing, the nonsense is advancing. No. Phalena paricīyate. By the result one has to be judged how far he has advanced. Similarly, there are so many persons, they are meditating. What meditating, nonsense? What is their character? If you challenge their character, nonsense. So these sort of things will not help. Come practically forward. Just like our students, going door to door, chanting Hare Krishna. And people are taking advantage of it, they are hearing. So this process is beneficial to the public. Even a small child who joins here, he also claps, tries to clap. So this Krishna consciousness movement is not to remain in a secluded place to get cheap advertisement, "Oh that man is meditating." No. Please let me know your thoughts about spiritual life and some of the interesting comments you heard. We celebrated Radhashtami (the appearance of Radha Rani) few days ago on 3rd September. Srimati Radharani is the eternal consort of Lord Krishna. Five thousand years ago, when Lord Krishna came to this planet to perform His pastimes, Srimati Radharani also appeared. 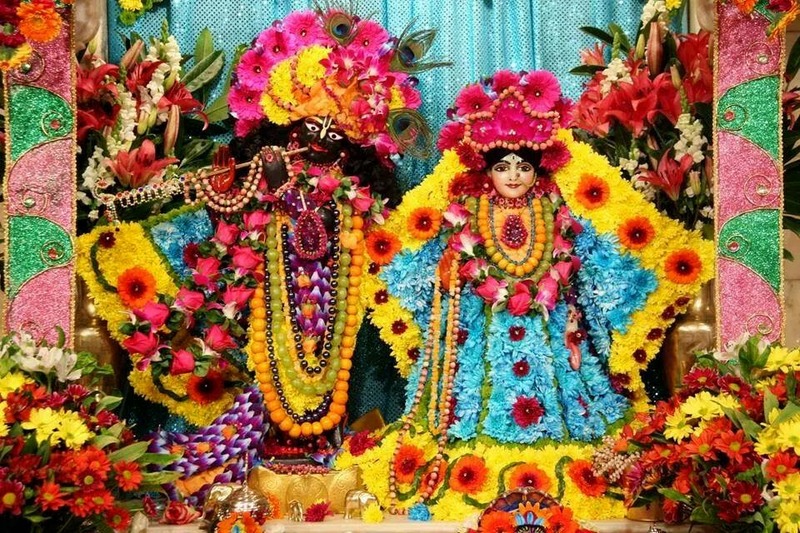 On this special day the deities of Radha and Krishna are dressed up in a dress made out of flowers. Please, find below some photographs from Melbourne temple and some more from India (Mathura, Barsana and Vrindavan) sent to me by a good friend and well wisher. 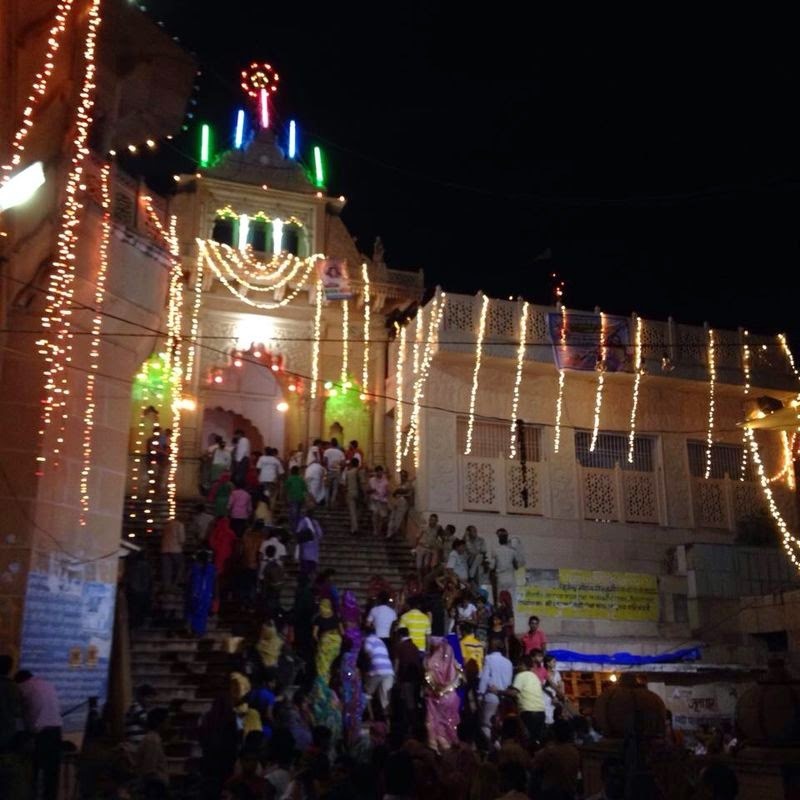 The news papers in India reported that "Chants of 'Radhey Radhey' echoed in the air early Monday as pilgrims and locals here celebrated Radhastami, the birth of Lord Krishna's consort Radha." 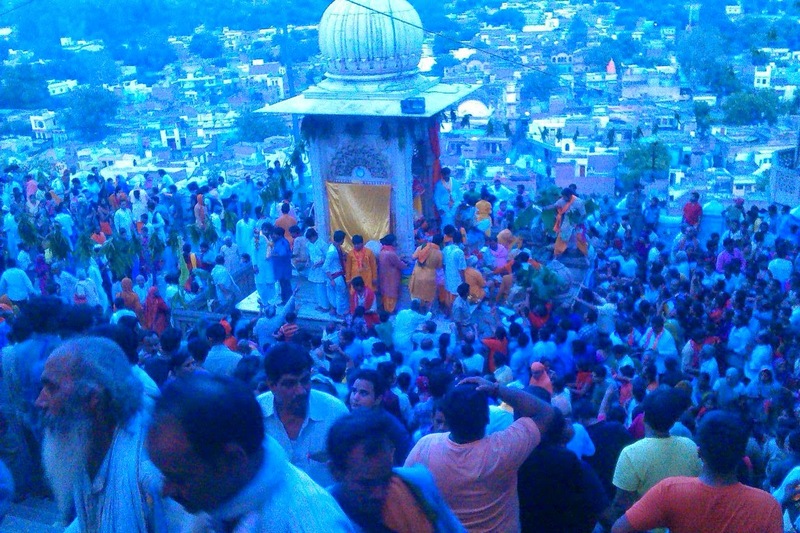 Barsana town is thus a site of pilgrimage for many followers of Vaishnavism, and especially Gaudiya Vaishnavism. 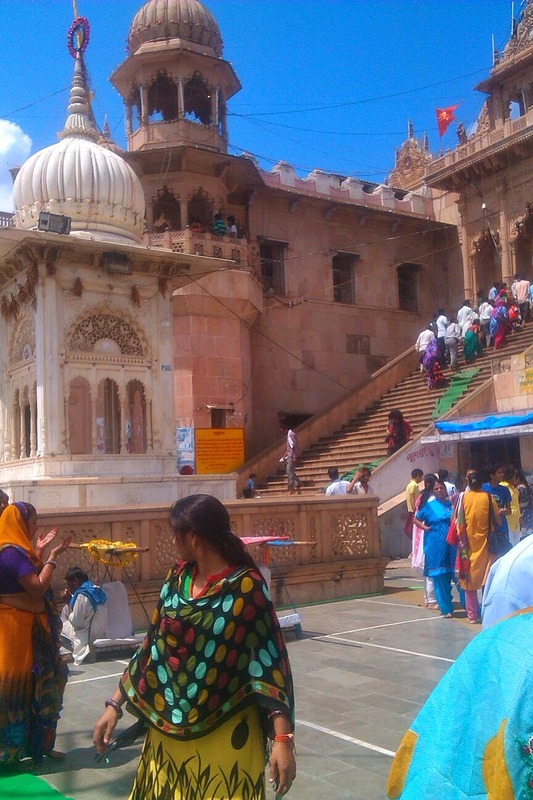 Barsana is the village where Radha rani spent her childhood. Today, there is a famous temple called Sriji Ki Mandir.I went to Barsana 3 years ago and the place has a mystic charm and serenity. I am hoping to there again this year.